Aylsham in Bloom organises an annual Traders’ Competition for town centre businesses. The only entry requirement is to have an external floral display. This year we are very pleased to say that we have Steve Downes. He joins a list of many well know judges and last year we had Gay Webster, editor of Just Aylsahm. Previous Judges have included Charlotte Philcox, Susie Fowler-Watt, (BBC Look East presenter), Greg Loades (Editor, Garden News), Richard Batson (Editor, North Norfolk News), Graham Barnard (BBC Radio Norfolk presenter), Thordis Fridriksson (BBC Radio Norfolk gardening programme presenter). Previous winners have included Coxfords Butchers, Bure Valley Railway, Carousel Chocolates and GF White (butcher). We are very pleased to announce that this year Aylsham In Bloom Traders' competition 2018 will be sponsored by Aylsham Town Council with a grant from the Recycling Fund. Whenever possible Aylsham in Bloom works with other local community groups. For example, the Army Cadets and Rotary helped refurbish the roundabout on the A140; local schoolchildren help grow plants and install them in town centre flower tubs. The Cubs have been very helpful with planting at the Drill Hall, Greening the Grey and with planting thousands of crocuses around the Town. 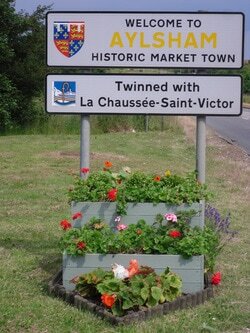 Aylsham in Bloom is part of the Aylsham Community Partnership, it is a Registered Charity, number 1166514. The Aylsham Heritage Centre is also a member of the Partnership.